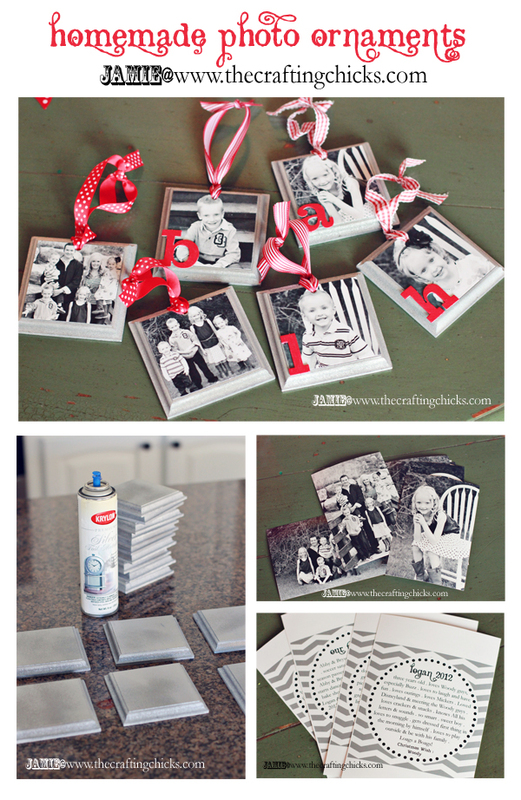 Time for my annual homemade photo ornaments! I have loved this tradition. I love looking back on past year ornaments-such a great keepsake. 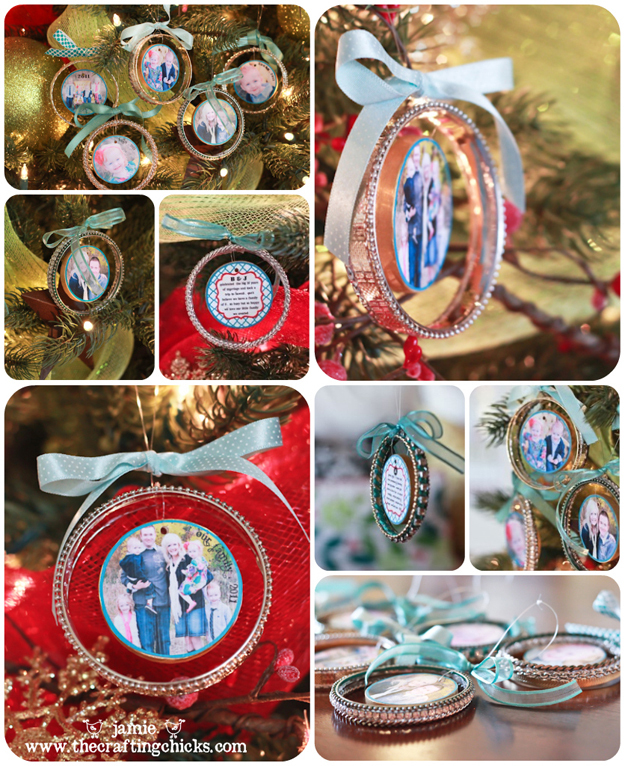 This year, while shopping at Poppy Seed Projects, I found their mini photo ornaments…and thought how perfect they would be for the 2012 ornaments on my tree! I ordered 4×6 photos in black and white of each of my children and our family. 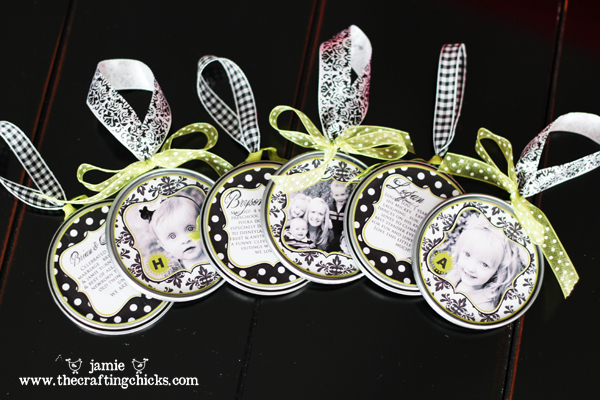 I also made a little digital design for the back sharing our highlights of 2012 and milestones of each kid. I spray painted each plaque with Kyrlon’s Silver Foil Metallic. I Love this paint…remember the pumpkins I transformed. After letting the squares dry, I drilled a hole at the top-to string ribbon through. While holding the photo in place on the square, I used a pen to draw a mark so I would know where to punch holes on the photos. I then used my trusty mod podge to glue on the photos, back & front, and to give a nice sealed finish on top. I added 1/2 inch festive ribbon and red painted chipboard letters for monograms to add some color. I love how they turned out with the silver and bright berry red! 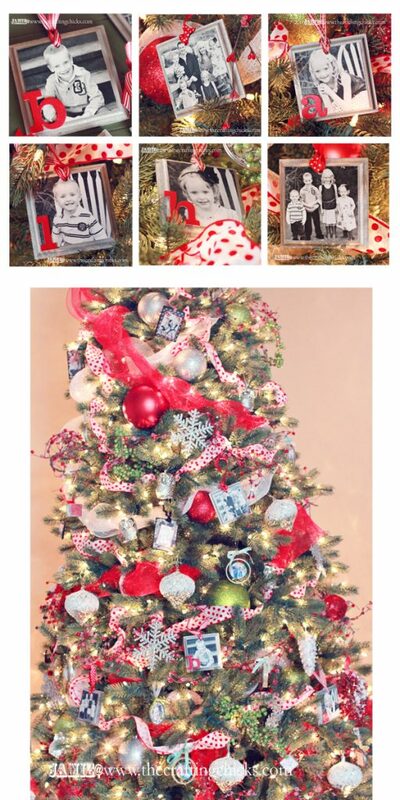 Every year I love seeing the photos on my tree…it makes me happy. My kids love hanging their “special ornaments” each year. We love using our photos in fun ways! 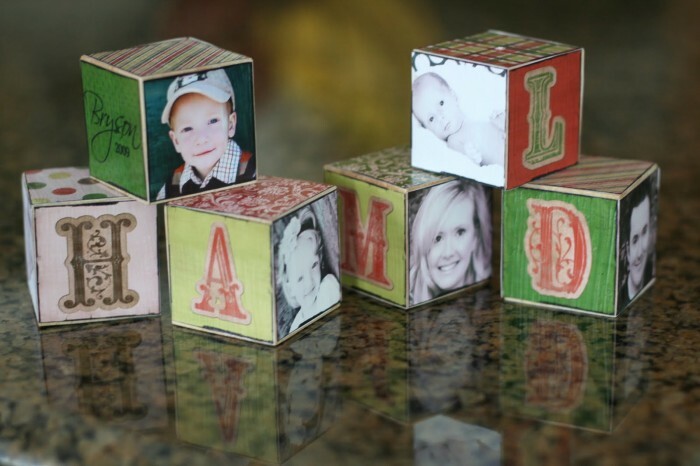 Check out this FAMILY PHOTO MEMORY GAME. Play this match game with pictures of your family. This makes such a clever gift idea too. where did you buy the mini wooden plaques? I looked on the site you linked but couldn’t find them to buy —- these are adorable!!! 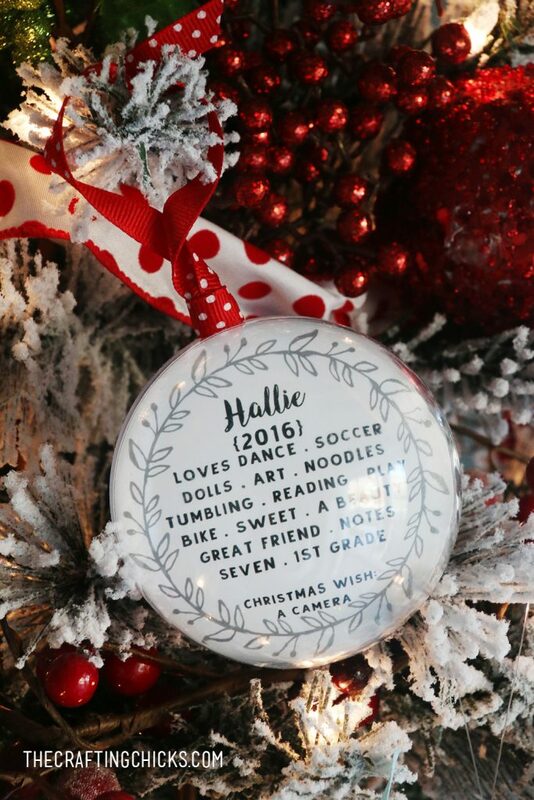 I love the ornament and would love to make some for our family. Would you be willing to share the template you used for the individual year in review you included on the back? @kris – Here is the link: http://www.poppyseedprojects.com/Kit/photo-plaques/photo-ornament. Glad I found them 🙂 So cute! Silly question because I’ve never used it, but do you use the Mod Podge underneath and on top of the picture to get it to stay? I gathered all of the supplies to make these today. I am also wondering about the template on the back. Did you use Photoshop? I’d love to have a little guidance in how to make something similar. Thanks! Hi thanks so much for sharing the little wooden ornaments. I am super excited to make for christmas. Would you mond sharing the format for the back? I just love it souch. Can’t wait to try to make these. Love them! Please can you share the template for the back? Thank you! Jamie didn’t make a template and she can’t find her file. So sorry. Which modge podge did you use? I love this ornament, I make ornaments each year for my nieces, nephews and grandchildren and was actually able to find the wooden plaque at Michaels and Joanne’s. I have the photos and am now wondering how to make such an adorable design for the back. What program do you use or do you sell your template? Thanks so much!! She used PhotoShop to make the designs. Jamie didn’t make a template and she can’t find her file. So sorry. WOW! All of your ornaments are beautiful & unique. Can’t wait to get started on my own! These are gorgeous!! Could I get the template too? You are amazingly talented!!! Hello, I understand there is no template but can you share what was written on the back of some of them to give me an idea of what to put? Thank you!! Super cute idea! Love them! I’m also wondering what paper you used for the photos… seem pretty easy to make. Where did you find the small metal square frames? I’ve tried putting photos on wood before and had the photo white out. I printed the photos from Walmart at their instant prints place. What type of printing paper did you use? Beautiful ornaments! You are a wonderful mother! I love these! I want to make them for my PreK children! 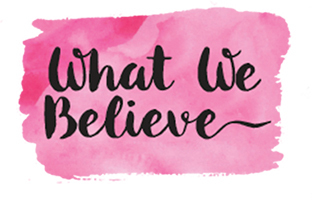 Can you share the template that you use on the back? Ha….just kidding about that. Seriously, they are perfect! Madison, we don’t take orders sorry! Are those wooden or metal plaques you used? I love this idea! i had a question though. what type of tile did you use? Also where did you find it? I love your ideas!! Looks very cute and absolutely easy and fun to make !! Just fyi, I found a 4 pack of the wood at Hobby Lobby for $2.99! 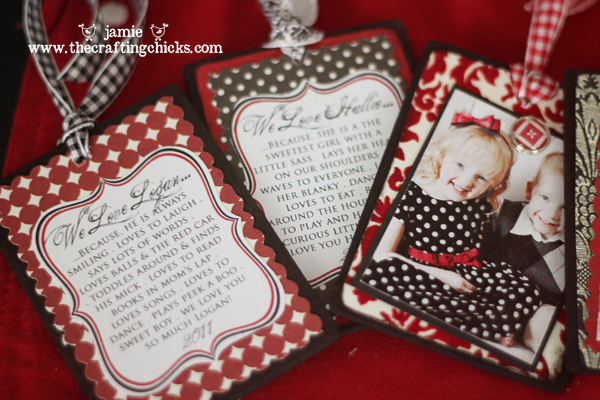 I love this idea for Grandparents or a Christmas present. I am wondering what kind of paper you used for the facts about your family on the back. Jamie designed the backs in Photoshop and printed them out on photo paper.